If you want to stop fake traffic from coming to your website, this can prove to be impossible but if you want to implement this, you will have to block legitimate traffic. There is no way you will be able to block spammers without being able to block legitimate users. When you have fake traffic, it might not be harmful to your website in general. If the spam is targeting your adverts, this can make you get dismissed from AdWords and other ad programs and this is to prevent click fraud. But do you know that spammers will not try to kill your user accounts? This being so, hardly will you find spammers, targeting adverts. The only reason you need to be wary about the fake traffic is the fact that it will hurt your Google analytics results. The reason you need to block the fake traffic from getting to your Google analytics is because you will get skewed results. Google analytics collects traffic of visitors coming to your website, and this will help when it comes to analysing information on your traffic characters. If the information consists of information from fake traffic, then you will be getting incorrect information. You will realize that fake traffic will come in different forms and each of them will need different solutions. This is traffic from any kind of software without a human being’s involvement. Google has its bots but not all are good. This makes it hard for you to block all bots and this makes banning them all not a good idea. This method that I am about to share will only be great for new websites and will not work for established websites as they will ruin your analytics history. When you get your new Google analytics ID, you will learn that it will have a digit at the end and it is usually 1 (UA-9835467-1). 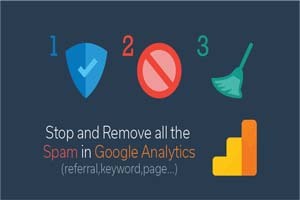 This being so, we advise you to create more Google analytics ID’s and add the third or fourth your website, this will act as a decoy to the spammer bots. There isn’t a defined method to block these bots. They cannot be predicted and this makes it hard for you to block them. The best way to go about this is using filters that will filter them from your results.